Rewards are at the heart of games. They come in many flavors. This article discusses how giving fewer rewards is more desirable for making a game’s economy tighter and the game more enjoyable for players. A study shows that adding less desirable information to more desirable information actually diminishes the total value of all the information that are presented. The same is true for items with a quantifiable monetary value (see study 1 in the paper). The problem is that the evaluator of a “bundle” (multiple items) subconsciously averages the value of the all the items. Mixing something very valuable with something that is less valuable will reduce the value of the higher valued item. Hence, when both are combined, the sum is lower. The perceived value is lower than the sum of its parts. 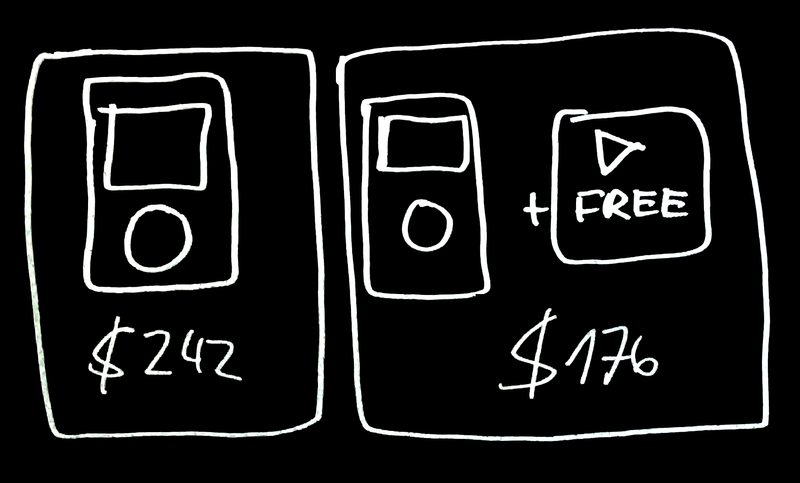 If your bundle aims at conversion, this might not be your biggest concern. But if the “bundle” is a set of rewards that players receive, then you probably create a lower motivation to pursue that reward by adding more items to the rewards. Less, in this case, is more. It sometimes hard to decide how to tweak the rewards along these vectors. The presenters’ paradox can be used to inform that decision. As the designer/balancer, you should be cautious about mixing different TYPES of items. Because you risk watering down the individual reward. You would give out less bang for a bigger buck! When your economy has multiple resources and systems: Giving out high valuable items together with lower value items, makes it less special! This is something you should strongly consider when you are in charge of designing bundles/prices for items in shops of free to play games! The perceived value of the bundle will be lower than the combined value of the individual items. The presenters’ paradox also works for penalties (check “Study 3: Littering penalties” in the study). Hence, if your game has a losing condition where players lose something, then just losing 1 Item/resource can be more powerful than losing multiple things. Rewards can be a tool to reinforcing or incentivizing a certain behavior. By receiving a reward, players know they have done something “right”. That they have reached a desirable game state. Players, of course, come with a certain intrinsic motivation and don’t play the game for rewards. Yet, players expect to get something back from the game when they have achieved something or made a choice. Explicit rewards can also motivate the player to engage in an activity that they otherwise not have e.g. Achievements. So we know that giving out multiple things for one activity can have a diminishing effect. Also, we know that we can incentivize player behavior with certain rewards. This means we introduce a choice. That’s cool. But as the designers, we must carefully adjust our reward-sources to meet the sweet spot between “exclusivity” and “uniformly distributed” rewards. Uniformly distributed means that you multiple reward-types from every system in the game. This means that players actions or choices come at a lower opportunity cost since they get more of the different types of rewards from any action. On the other hand, this reduces the sense of choice. Again I would like to emphasize that there are tons of other factors that make players enjoy a game. Rewards are just one (important) element. Players will have preferences for mechanics/systems based on many factors (which we only have partial control over). What we do have control over, is the rewards balancing. So let’s continue with that. The point is: Know your players, decide what kind of decisions you want them to make, and then adjust the reward balancing to that. None of the approaches are perse bad. But we should make it a choice in the design rather than just letting it happen. These small decisions heavily influence how player experience the game and informs their decisions. As designers, we have to use every opportunity to shape that experience. Opportunity costs and resource scarcity drive players decisions, so by reduction of rewards/opportunities, you end up with a higher player agency. Less is more. What systems are part of the core loop, which rewards belong to these systems and which ones not? Analyze sources sinks, and try to assign the sources only to those systems where you need them. Argument 2+3 lead to players having an easier time of building a mental model of the game’s economy or system. When it is clear what choice yields what reward, the players can grasp more easily the systems intentions. With a small team, I am working on a turn based squad tactic game. We can place loot on the map but also enemies can drop loot of various kinds: currency, med packs, and other consumable items. Instead of adding loot crates that drop a bit of everything, we decided to have distinct loot-crates for each of the item types. Players can then get an idea what the loot crate might contain and incorporate that into their strategy. Whereas if all the loot was the same, it doesn’t really matter where players go with their squad (Argument#3). We also wanted players to feel rewarded when they get the loot. Since it is actually quite rare to get it, we also decided to put just one item into the crates for the sake of Argument#1.